A Shibu is a satellite training group, led by a student of the dojo who has been sponsored to teach by the Dojo-Cho (head of the dojo). Shibu-Cho (Group Leaders) are sponsored with the full confidence of Shihan Capers, and return regularly to the parent dojo in the Twin Cities and/or make regular trips to Japan. These training groups will use the word Dojo in their name, reflecting a determination to follow through with their commitment to training and to the students they train. Rank and other official paperwork is handled through the parent dojo, until the Shibu-cho becomes a Shidoshi (licensed instructor). 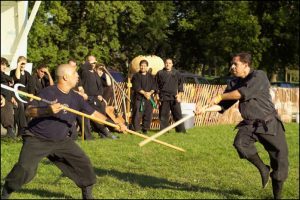 Dojo Affilitates are school that are led by a fully licensed Shidoshi who received his/her training at Mizu Nagare, and who faithfully maintain the traditions of Bujinkan in their schools.